"This simple, tasty recipe yields 12 to 16 cookies, but is so simple that it can be doubled (or tripled!) easily." Beat peanut butter, white sugar, and brown sugar together in a large bowl with an electric mixer until smooth. Stir egg, vanilla extract, and baking soda into peanut butter mixture; stir in chocolate chips. Drop mixture by small rounded spoonfuls onto a baking sheet about 2 inches apart. Bake in the preheated oven until cookies are flattened and golden, about 8 minutes. 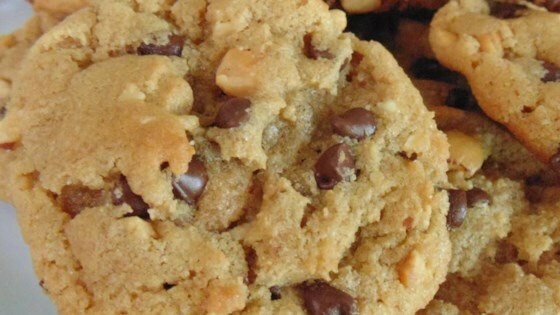 See how to make yummy gluten-free peanut butter cookies. Very good recipe, although I cooked them for 10 mins and not 8 and they turned out great !!! Made with crunchy peanut butter (3/4 was Adams, and 1/4 Kraft). Delish! I've heard that using natural peanut butter can sometimes make recipes a bit drier, so next time I will use Kraft. Really good cookie! The kids loved them. I added reese's pieces instead. Really easy to make. The peanut butter tastes like like nutter butter cookies. Yummy!